The champions beat the Jags 4-1 at Firhill over a week ago before home wins over Hamilton and Dundee took them back 11 points clear of Rangers at the top of the Ladbrokes Premiership. The Northern Irish boss, who will involve some of his Under-20 squad against Partick Thistle as he tries to manage a nine-game December schedule, insists there is no problem playing Alan Archibald's men so soon again, in a rearranged fixture at Celtic Park tonight. 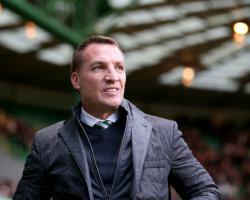 Rodgers said: "It is good because you are trying to anticipate what they are going to do. "They played with a (back) five before and Alan might have looked at the last two games here and thought: 'Will we play with a five and frustrate or do we go with 4-5-1?' or whatever. "But it is fine, it is the game and we will be ready." Celtic are unbeaten in 20 domestic matches and already have the Betfred Cup in the trophy cabinet after their Hampden final win over Aberdeen last month. Defender Erik Sviatchenko believes that if the Hoops play to their best then the opposition should make little difference. The Denmark international said: " In the main we think about our team and with the quality we have, that should be enough when we are at our best level."